Athleticism runs in the Fendig family as is evidenced by the following excerpt that was omitted from the initial publication of Voices from St. Simons. "My daughter Lou, was a pretty good tennis player. She played number two at the University of Georgia. She also made it to Wimbledon one year. About 1958, I played in the Sea Island Golf Club Championship. It was a good match against Sonny George, a fine athlete from Brunswick who went to Wake Forest on a football and golf scholarship. Arnold Palmer was one of his teammates on the golf team. In that particular tournament, we played match play on the Sea Island Course. We were coming up on the backside, number 16, which was a par 4 hole over the water with a big trap on the right. Sonny and I were all even at that point. If you hit it long enough, you could shoot straight across the water towards the green, or you could go to the right a little bit and play it safe. I played it safe and went to the right, and my ball went into the trap. Sonny hit his ball straight toward the green and was sitting safely in the fairway past where my ball was. At the time, that trap was very steep, and I didn’t think I could get it to the green from there. There was a little westerly breeze behind me, and I took a five iron because I need some loft to get it out of the trap. I guess I made the best shot I ever made because I knocked it on the green, which was a narrow green. I don’t know how I hit that five iron that far. It was a good two hundred yards. Sonny had a clear shot to the green but didn’t make it. I pared that hole, and he took a five. So, I was one up. Number 17 was a par 3 hole, and we both pared it. The eighteenth hole was a par 5, and I took a five and win 18. He took a six, so I beat him two up. But he always claimed that I beat him one up (laughs)." 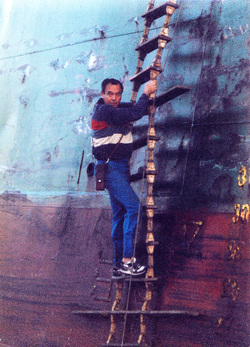 Image: Captain Fendig climbing from pilot boat onto freighter. Photo by Lou Fendig.